The Kruse LTC is implemented in spark-ignition direct injection engines by extending current designs to inject fuel in variable quantities and at multiple points during the compression and power strokes. For example; the cycle, in its full embodiment, might comprise of a pre-mix injection in the early part of the compression stroke to give good mixing and reduce charge temperature, a second injection of a portion of the fuel near the completion of the stroke to achieve a chemically correct mixture for ignition, and a third injection during the expansion stroke to obtain maximum power. By using this methodology for the introduction of fuel into the combustion chamber, it is possible to completely digitise the process for all variations of engine cycle and load including maximum economy (lean-burn) and maximum power without needing to follow the conventional mode of practice that entails one injection per cycle. Moreover, as the Kruse LTC is based on a fundamental law of physics (pV=nRT) and the laws of thermodynamics then much of what is required to implement the cycle is predictable and not subject to empirical analysis. The Engine Cycle Analysis charts below compare a standard Otto cycle process at 10:1 with a Limited Temperature Cycle process at 16:1. 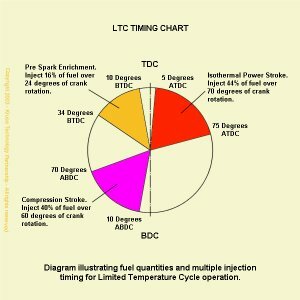 The point to note, despite the difference in compression ratios, is that for similar levels of power and efficiency the peak combustion temperature for the LTC process is 2,453 R below that of the Otto process. A comparison of the Temperature-Volume and Temperature-Entropy charts for the Otto and LT cycles generated from the data above, graphically illustrates the reduction in temperature and the isothermal process that takes place with LTC. It should be noted that the above data is formulated on the ideal air standard for both Otto and Limited Temperature cycles and does not include real world engine losses, which would result in lower actual peak temperatures. However, as the losses would be approximately the same for similar engine configurations, the data is presented as a reasonable comparison between the two cycles. The specific heats of the actual gases increase with an increase in temperature. Each cycle requires an inlet and exhaust process, thus there are losses due to the mechanical work involved in opening and closing the ports.